It’s been much too long since last posting material on my blog but there’s a reasonably good excuse for it. In February 2016, I had rotator-cuff surgery on my right shoulder for the second time. The same surgeon who repaired my shoulder in 2011 told me to expect about an 85% recovery, meaning use of my right arm. He also assured me that fishing as in the past would not be part of my future. Serious limitations would have to be set and accepted. After that prognosis, learning to fish left-handed was added to my to-do list. From late 2015 until my scheduled surgery date in mid-February, boredom ruled an endless series of days that revolved around resting my shoulder; the goal to minimize inflammation of tissue before surgery. That’s easier said than done because I don’t do “coach potato” well at all. While pacing the floor twelve days before surgery, a pause in turn 6 found me staring out a window. It was a beautiful sunny day with a light breeze and temperatures well above normal. Claustrophobic and depressed, a beam of sunlight suddenly struck me and the idea of running to a local river to practice left-handed casting came to mind. A quick analysis of pros and cons confirmed that learning to fish left-handed was an important part of my recovery plan and something that could begin before surgery. Also, free time was available in profusion. So, with an upbeat attitude, away I went. In hindsight, more thought should have been given to the cons. After arriving at a river full of smallmouth bass and tying on a Texas-rigged soft plastic, casting practice began. The first few attempts were at weeds and sticks on open ground away from trees; a wise starting point. It’s shocking how difficult it is for a righty to make a simple left-handed lob-cast. But with practice my lure was soon hitting the river, and at times close to the intended spot. In perhaps a dozen casts, I felt a light tap through the line, reeled down and set the hook. The force of the hook-set, an equally awkward movement left-handed, pulled a nice smallmouth to the surface where it immediately threw the lure. In response, I turned and stepped in a muskrat hole all the way to my left knee-cap. While falling in slow-motion, all concern shifted to my shoulder so rather than trying to catch myself, I attempted rolling toward my good shoulder. The next morning after draining 70 cc’s of blood off my left knee, an x-ray showed no visible breaks or tears so an elastic knee brace was added to my post-op equipment list. After two months of recovery from surgery and plenty of physical therapy, my routine at home had returned to staring at the walls and laps through the house. Soon lap times were approaching those before surgery, except a few of the more hazardous turns where I didn’t want to press the damaged knee. After consulting my best fishing buddy, we decided it was time for me to get out on the water but with some serious restrictions. We agreed that trolling for brown and rainbow trout was a good choice because I could sit and stare as easily as at home and would get some fresh air and sunshine in the process. My attitude improved after discovering I could operate the landing net left-handed with little difficulty. After a fish or two, it was game on! My first trip afield, two months after surgery. Couldn’t operate the boat or a fishing rod but enjoyed netting some nice brown and rainbow trout. We caught some beautiful trout that day up to twenty-three inches long and the therapeutic value was beyond measure. 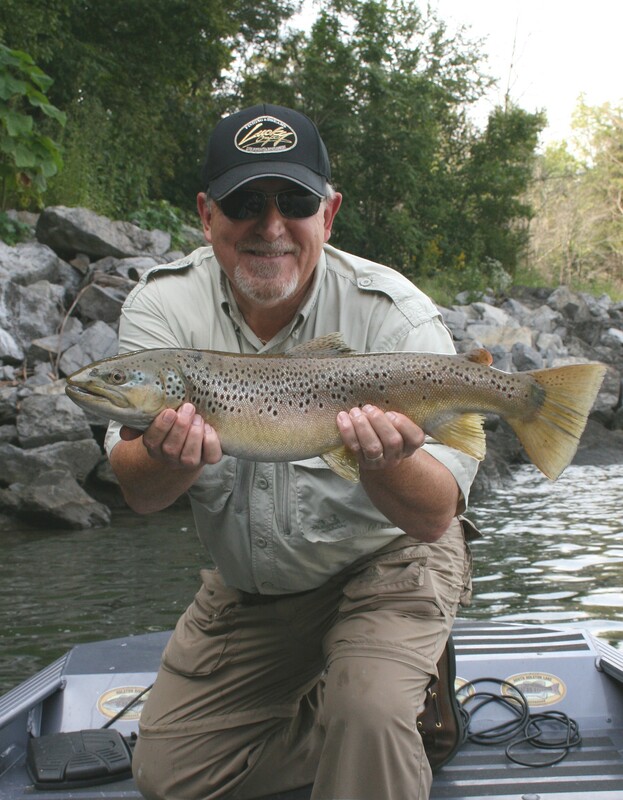 On a follow-up trip, several attempts at casting with ultralight tackle confirmed it was too much movement, even casting left-handed, so the decision was made to do only what my body would comfortably permit; with patience, careful patience. Four months after surgery, progress permitted me to use light-weight spinning tackle for short periods. Over time, growing confidence pressed me to search for fish that would test my strength; time to try some night-fishing for reservoir smallmouth bass. During a couple short trips, the number of casts was low but several nice smallies accepted my offering and fought like champions. Landing them boosted my confidence but again made me realize it was still a long way to full recovery. A month later, an MRI was ordered to see why the knee was still bothering me. My surgeon, obviously bug-eyed with disbelief, slowly walked into the room staring at my MRI results, which had been delivered by yours truly minutes before. “About that knee, we have a fracture,” he announced after a long pause. His review described a hairline fracture across the largest bone in my knee that had not shown up on the post-accident X-ray. Yep, I had broken it. He closed by telling me no further treatment of the knee would be necessary, other than some simple exercises, because it was healing nicely. He closed in saying, “This is a testament to how tough you are.” He must have said that because of my work schedule at Bass Pro Shop in the months before my MRI. Who would have guessed? The arrival of fall found me much more active. My right shoulder was still weak and tender with limited range-of-motion but casting left-handed had become almost routine. Days after beginning some new stretching exercises, the broken knee was forgotten. I was strong and mobile enough that launching the boat was no problem and could fish for about an hour before having to rest my right arm. 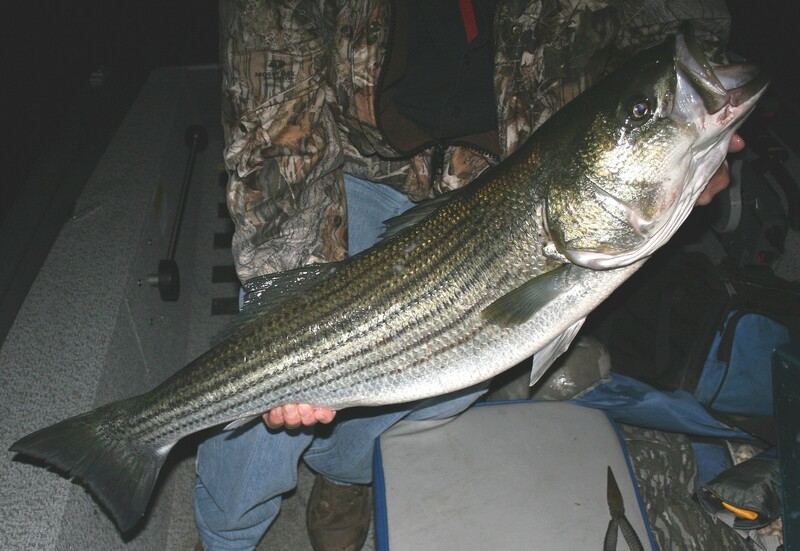 After a cool snap brought the first freezing temps of the season, a search for schooling striped and hybrid bass began. Fishing for surface-schooling fish is a mixture of much driving around, setting and watching for fish breaking and casting for short periods; an almost perfect match considering my limitations. 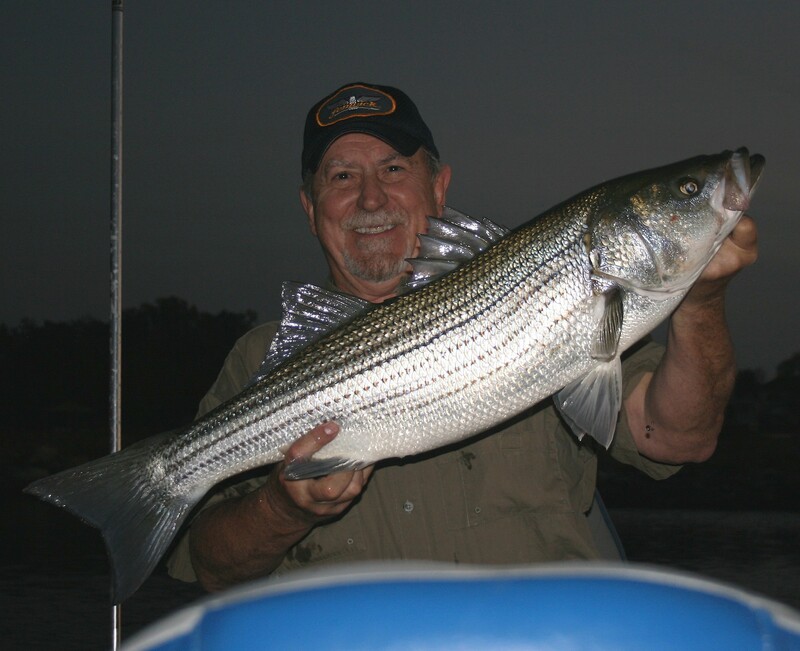 With a selection of rods rigged with favorite fall striper/hybrid lures, the adventure began one sunny afternoon. Surface water temperature was ideal, in the mid-60’s, and confidence was high. After a long search, clouds of baitfish began appearing on the depth finder in a long narrow cove that ran inland off the main lake. 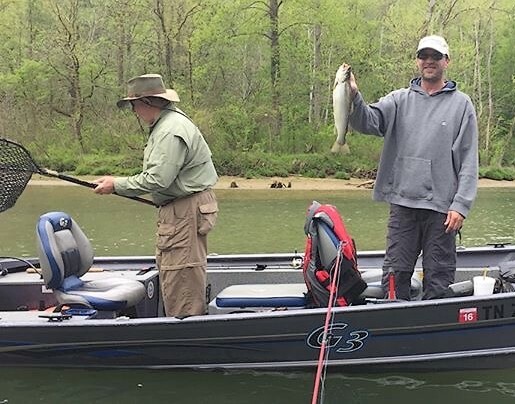 The narrow strip of water didn’t look like much when driving by but an expanded search found it full of baitfish with water depths exceeding forty-feet along much of its surprising length. After confirming it was full of striper food, I moved back where I could see the main lake and much of the cove. It was time to drop the trolling motor, set back and wait. An hour later the water erupted on the main lake close to the mouth of the cove. Big fish were smashing schools of baitfish not more than a hundred yards away so I moved quickly toward them. Soon there were fish smashing the surface in every direction. Then a jointed Storm ThunderStick landed among the explosions and began making a V-wake along the surface, then a seven-inch Cordell Red Fin, then a large swimbait fluttered along a few feet beneath the surface, all without so much as a bump. Round two with the ThunderStick included variations in speed until, finally, a boil rose beneath the plug. But that was my only strike after more than an hour of casting to feeding fish. Minutes later the water went flat and calm; the party was over and the fish were gone. My mind was sorting through possible reasons for the lack of success when a crippled minnow fluttered by along the surface. The minnow’s size surprised me because it was much smaller than expected. After slowly approaching several schools of surfacing minnows for further size checks, my suspicions were confirmed. My lure choices were too large. The next day found me waiting in the same spot but with smaller lures rigged. My primary rod held a modified version of the plug that had produced the boil; a Storm ThunderStick. The modified version had the rear section removed with the split ring and hook reattached to the front. 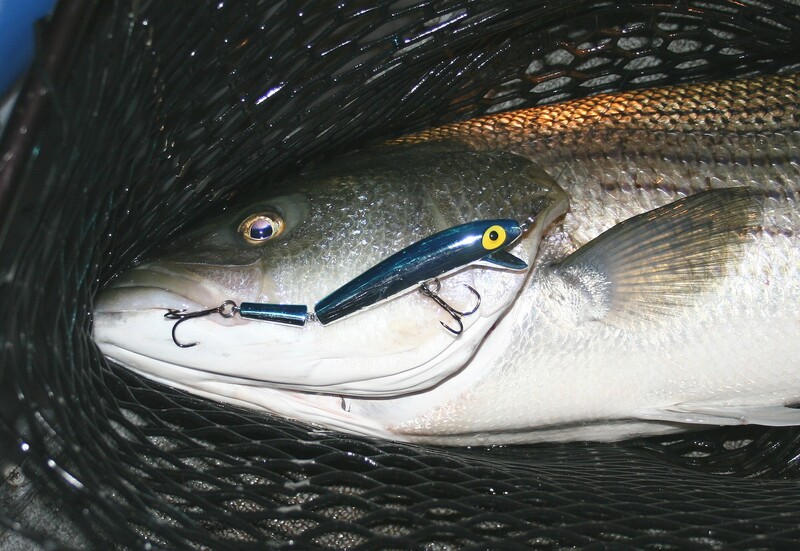 With this simple change, the lure’s length was reduced from more than five-inches to four with no change in the plug’s action. Back up combos included a smaller swimbait and a Rat-L-Trap. Soon after arriving a good fish boiled the surface close by, then another. Suddenly, an area the size of a parking lot was filled with watery explosions. My first striped bass caught left-handed. Almost immediately a fish attacked my modified ThunderStick and after a brief battle, a three-pound hybrid was in the net. After a quick release, the ThunderStick again sailed into the melee. On the next cast a big fish crushed the plug and pulled a deep bend in my rod. There was no question it was a much larger fish because it ripped line freely from the reel and forced me into a defensive squat. 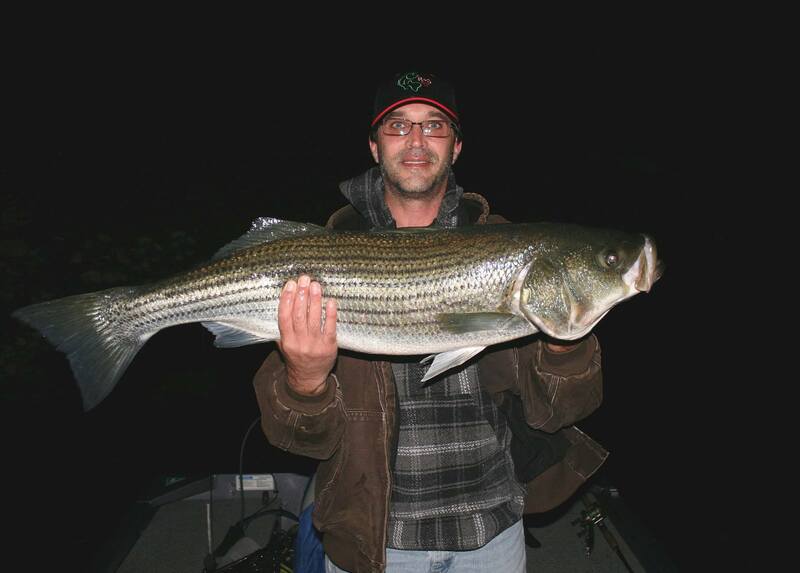 After several line-stripping runs, the fish finally surfaced close to the boat; a striped bass in the mid-teens. At boat-side, a firm grip on the fish’s jaw was shaken off as if attempted by a child. I could grab the fish well enough but any attempt to lift made me realize how weak my arm was. The idea of shifting the rod to my right hand was rejected quickly after the fish surged; there was no way my right arm could take that. After remembering a gaff stowed in the rear of the boat, the fish was safely landed and released unharmed, save a small hole in its lower lip. In the time taken to land the fish, snap a couple pictures and release it, the surrounding school of feeding fish disappeared and the water became still. It felt like the end of a standing ovation as the last few tail slaps subsided in the background; a rewarding afternoon. In the best of moods, a decision was made to add a new Boga Grip to my fishing tool box. Work and book signings kept me busy through the Holidays but by mid-January fishing fever returned. Thoughts of visiting a highland reservoir for bass crossed my mind but required a significant investment of time and exposure to some very cold conditions. So, brief trips to pitch soft-plastics from shore to river smallies moved to the top of my schedule. But one day, a friend and coworker at Bass Pro Shop told me about a pattern for catching big walleyes during the coldest period of winter. 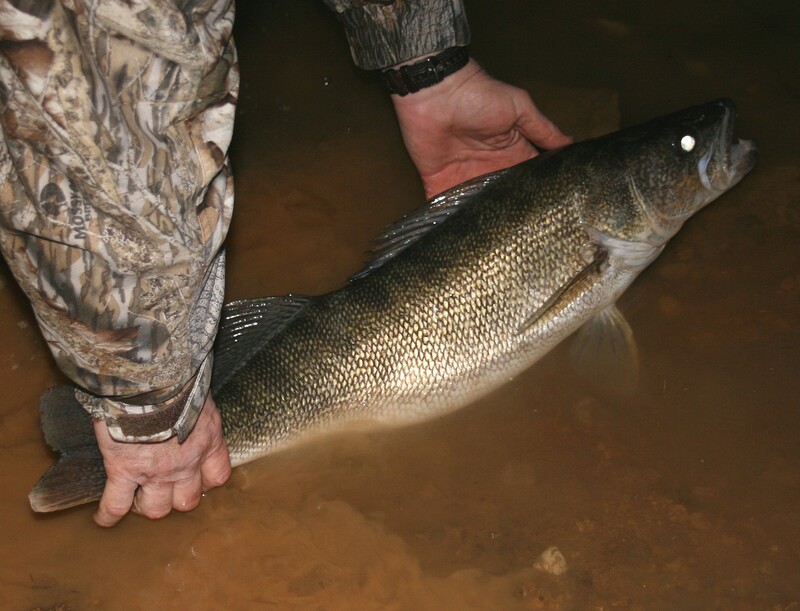 Walleyes spawn in late winter/very early spring in the south and many instinctively migrate into moving water as the time to drop eggs approaches. Areas with increased current attract pre-spawn walleyes and those that hold abundant prey such as alewives, shad, even trout, may attract many of the largest walleyes in the system. The pattern my friend described required fishing a local reservoir from shore at night during the coldest part of winter when the lake water level was at its lowest. The low water period lasted but a brief time, while at winter pool, and wasn’t about how many fish you could catch but how big the fish were. I had to sign up for some of that. 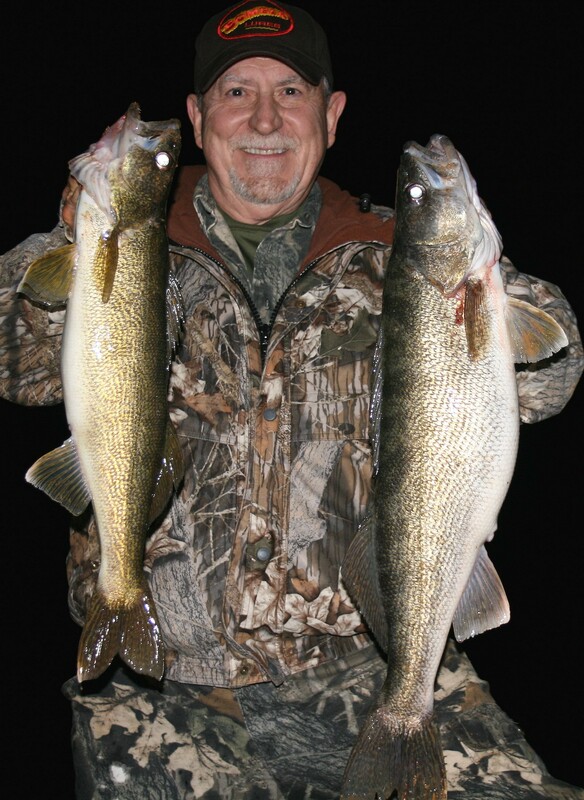 My first trip to fish at night for winter walleyes was more about exploration than serious fishing. Learning details like water depth, temperature, bottom contour and structure present would help me decide which lures would work best. Casting hazards and required distance would dictate the rod and reel combo needed for precise presentations. After exploring and casting for an hour I decided an adjustment in equipment would permit me to fish the area well with a large swimbait, one of the lure’s my friend recommended. Several days later we returned with a third fishing buddy and spread along a sand-covered shoreline that gradually sloped from the water’s edge to a meandering creek channel. In many places, a long cast would reach the channel’s edge. In some spots, there were trees lying across the barren shore with their tops partially submerged in shallow water. Soon we were spread along several hundred yards of shoreline, casting from parallel to shore, out to along the edge of the channel break. In fewer than thirty-minutes, as my swimbait tapped along bottom in the shallows, the water boiled and my line became tight with a heavy, head-shaking fish. Minutes later the glowing eyes of a big walleye surfaced against shore as one of my fishing buds arrived carrying another fish. A break to check size revealed his walleye weighed four-pounds; a nice fish and average size for the lake we were fishing. Mine was a hog weighing eight-and-three-quarter-pounds and stretching twenty-seven-and-a-half inches. A week or so later another trip rewarded me with a twenty-seven-and-three-quarter inch walleye that looked a little fatter, though I didn’t take time to weigh her before release. Soon after, spring rains arrived much too early and the lake began rising quickly. I’ll be back to visit those fish again after the next Christmas Holiday passes. So, I have finally returned to the fold, so to speak. Fishing and writing are again part of my routine though use of my right arm is still limited. In support of my continuing recovery, trolling will be included in much of my future fishing; rainbow trout, crappie, walleye and others come to mind. Another angling method I’ll employ frequently is presenting live or dead baits on set lines. Big carp, striped bass and catfish are suckers for the right baits presented on bottom. Both approaches will permit me to fish with limited stress on my shoulder while I strengthen it further. However, occasional trips to enjoy long-standing-favorites such as night fishing for summer smallmouths and the fall topwater blitz will be made; left handed of course. Visit me here to read updates on my progress and angling adventures, including new things I learn. In closing, it is with great sadness that I bring readers news from R&S Bait Company. In late May of 2015, our sport lost a rising star when Rodney Williams, owner of R&S Baits, lost his battle with cancer. Now, his family has no plans to continue operation of the company and the R&S Web site has been closed. Such a loss; a dear friend and talented contributor to our sport. To provide some history about my friendship with Rodney Williams, there’s a story in my book about fishing small jigs for summer smallmouths at night using black lights, though at the time my book was published I didn’t know R&S Bait Company manufactured the jigs described. A story posted on this Blog about meeting and becoming friends with Rodney Williams attracts a lot of traffic and many readers inquire about availability of R&S Baits’ products. If you’d like to read the story behind the story of how we met and became friends, find the Archives button at the top right of this page, click Select Category, then select Announcements and you’ll find a story called “From My Friends at R&S Bait Company”. To read a story about night fishing with R&S Baits Arky Smallmouth Jigs, select Summer Fishing and scroll down to a story called “Day and Night Summer Smallmouth Bass”. To see the side bar photos from each story, click Enlarged Side Bar Photos at the top and select the story title. It’s good to be back. Be safe and good fishing!